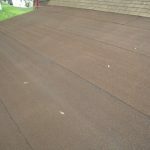 Are you considering changing your existing Illinois flat roof or installing a new flat roof (or a low slope roof)? Some of the Illinois flat roof types listed above are more likely to be used on commercial buildings than on residential property roof, but you’re the boss, and we can install it for you. 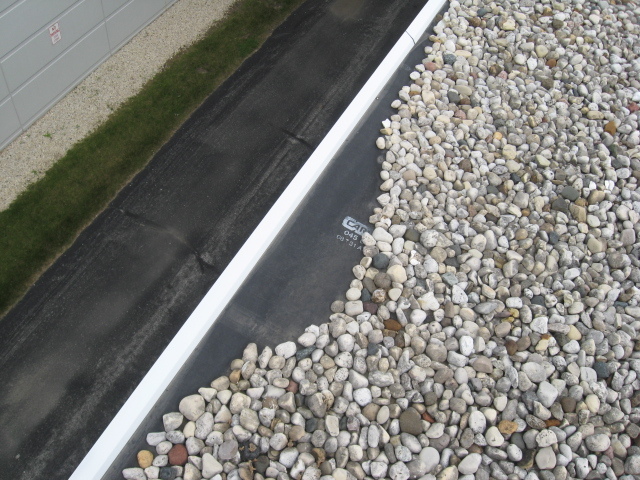 Each properly installed Illinois flat roof systems must provide a waterproof covering over a structure below it. 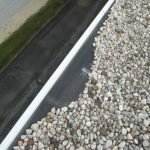 Rain water is removed from such roof either by flowing towards the drains, downspouts, and gutters – there’s usually a slight pitch on the roof, or on some designs by evaporation. 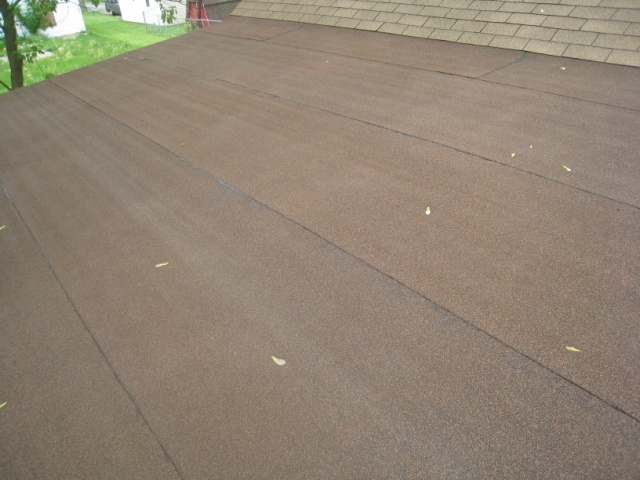 Let’s go over those flat / low slope roofing materials that are most popular in Illinois. Low cost, in most cases the cheapest one out of the flat roofs, built from 3 or more plies of waterproof material alternated with hot tar and covered with a layer of smooth river stone. Originally, built-up type roofs where made out of tar paper (organic), and asbestos based felt, but over the years more advanced materials have been developed and these types of roofs are currently using fiberglass mesh membranes. Tar paper – heavy paper impregnated or coated with tar, used as a waterproof protective material in building. 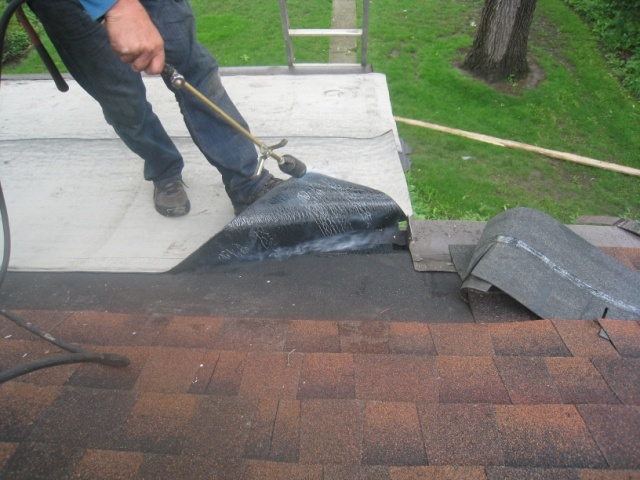 Built-up roofing life span depends on number of the installed waterproof material layers / plies. Each one is rated for approximately 5 years of performance, which depends on quality of the installation and seasonal maintenance. Built-up roofing is quite heavy and roof structure must be designed to withstand the weight of the gravel layer. Installation process is not very clean but that’s our job and you don’t have to worry about it. 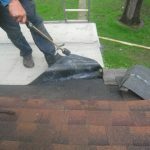 However, you’ll have to maintain drainage points – gutters and scuppers, to prevent clogging with gravel and other debris that might accumulate on the roof surface. One more thing to remember – in most situations, it is difficult to pin point the source of leaks on such roof. Because of the multi-layer design, the water might travel between the plies and start leaking several feet from the actual point of membrane penetration. It’s one of the Single Ply Membrane types. This type of the flat / low slope roof uses material similar to ice-and-water shield. Ice-and-water shield, also called weatherguard or weathershield, is a rubberized material that comes in a roll just like felt paper. The most common applications of this material are along eaves, in valleys, sometimes around vents and chimneys as extra protection. The only difference is that its exposed surface is impregnated with a mineral based protective material. Torch-down systems that involve heating the adhesive as the material is unrolled – this one is a fire hazard, so let the pros do it unless you really know what you’re doing. There’s also peel-and-stick type of a membrane, that is much safer and easier to apply – this can be easily and safely done by a homeowner. PVC (polyvinyl chloride) – it’s another single- layer type of roofing membrane material. PVC roofs are exceptional in withstanding ponding water. This single layer membrane seams are welded together with hot air creating single sheet resistant to moisture penetration. PVC roof surface reflects nearly 90% of the heat of the sun, maximizing energy cost savings. Single layer, durable rubber roof, engineered for long lasting performance and UV (ultra violet) resistance. EPDM is one of the most common types of low-slope roofing materials, because of its relatively low cost and simplicity of installation when compared to conventional built-up roofs. 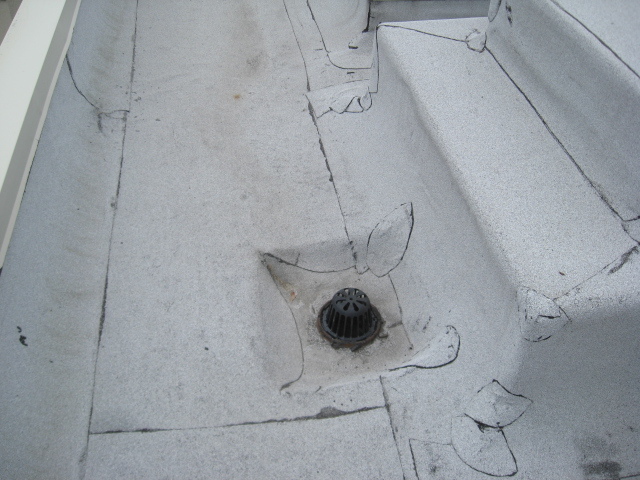 EPDM roof can be mechanically anchored with fasteners, ballasted with stone, or glued to the decking. Properly installed EPDM rubber roofs usually last between 12 and 25 years – this will depend on : environmental conditions, foot traffic, water ponding on its surface and evaporation speed, geographical location, and of course – quality of workmanship. Provides a quick, cost efficient solution. However, its life expectancy isn’t that great – usually lasts somewhere between 5 and 12 years. Rolled asphalt roofing material typically consist of a single layer, asphalt-saturated organic or fiberglass felt. 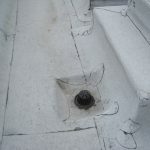 The roll is fastened to the roof decking surface (it might be applied vertically or horizontally) with nails and seams sealed with lap cement. Just like with other roofs – installation plays an important role in its performance and maximum life expectancy. That’s basically it, make a choice of your Illinois flat roof or low slope roof membrane type, and give us a call, so we can help you with converting this decision into reality.